Does anyone know that Mokopa missile and Mupsaw secretly entered service with the SAAF? Mupsaw was cancelled. Though Denel helped Pakistan with the development of their cruise missile. Cruise missiles weren't that needed or a user requirement, our long range strike and anti-ship capability was filled by the Buccaneer bombers which had air to ground missiles or glide bombs. Does anyone know that Su-30 Flanker jets with BVR missiles secretly entered service with NAF ? A Doctor with only a backpack is a medic you fool. Okay, your doctor only had a backpack. That's all the supplies he had. He didn't even have the essentials. That's all the supplies he had for 400 troops....... Like this is any better. Please don't cry, I can't offer you wipes. They very big backpacks. Enough to gear is in it for a small surgery. Yes but they crashed them all. Patches689 has had a complete mental breakdown. The desperado can't come to terms with the ineptitude and incompetence of the SANDF. lol, that dude bleeds in the heart and pretend to put out a strong facade. pre-1994 South Africa was a hype!!! Post-1994 South Africa is a criminal representation of facts. This is the beginning of decay of South Africa. We've seen in its societal structure, in institutions , schools and in the military. South Africa has the best infrastructure, universities and military support companies. South Africa has the most rapidly decaying infrastructure in Africa. We're building still, while you're decaying. Everything your anglo-Dutch built is rotting away at an unprecedented fast pace. 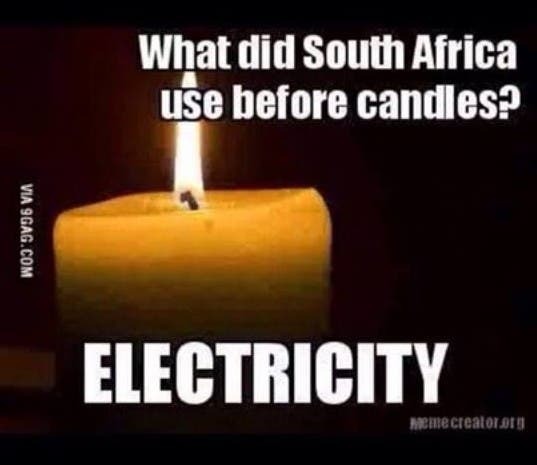 If you compare to other countries some don't even have electricity. Production is greater than all sub-saharan countries. You do know we have not had issues for some time now. Compare to countries like Nigeria, Kenya, Algeria and Morocco. Eskom get R4billion loan to upgrade grid. Government to give Eskom R10 billion rand bail out in June. You have power cut issues today, I have a new Southie contact with me here, he tells me it will take many years to build new capacity and get South African enough electricity supply. You will remain screwed up for a long long time, massive power supply capacity CANNOT be built overnight. 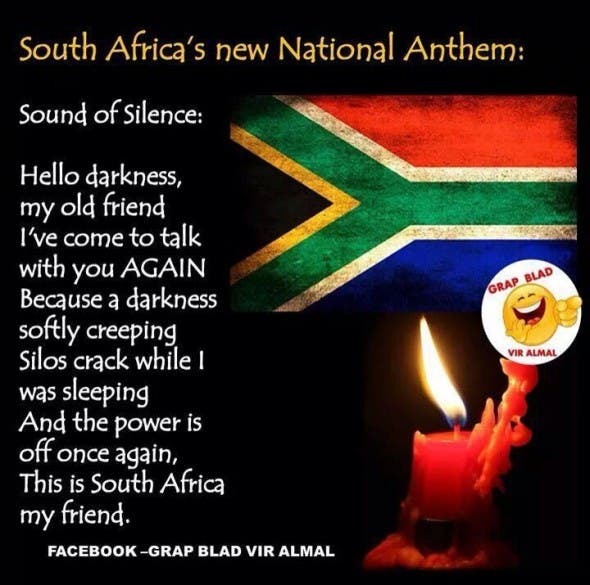 Do you think SA is Nigeria that lives in the dark with generators? Your friend told you lies, the situation is now a lot better. That's just one of the things intelligence officers do. You are now shamelessly shifting the goalpost,who was talking about 'intelligence' officers?,what i typed was 'intelligent officers',if you cant tell the difference between "intelligent" and "intelligence",then i'm thoroughly sorry for you. With our current capacity we supply power to southern Africa. Sure we struggling but at least we have. majority of your military is peoples by ill-trained Zulu fighters who got drafted in by 1994. Your institutions are filled by half-literate employees forced in by ANC. 2014-04-24 12:06 Johannesburg - In the bowels of Africa's largest hospital, doctors carry out emergency surgery by the light of a cellphone while, in a nearby ward, seriously ill patients are sardined three-to-a-bed. Twenty years after South Africans jubilantly swept apartheid aside, Johannesburg's Chris Hani Baragwanath Hospital, like many of the country's post-apartheid institutions, has failed to live up to the dream. Away from the country's high-profile political scandals, a more pernicious institutional crisis is ravaging the "Rainbow Nation". Small municipalities and large ministries are being eaten away by corruption, mismanagement and the enormity of serving all of the country's 51 million citizens, not just an elite few. The problems are "systemic" and require a complete "overhaul" according to Phophi Ramathuba of the country's doctors association, but they are not limited to the health sector. When I told you whites are your saviours, you beat your chest like a gorilla and deny. When I compared you to Burundi, you thought I was being funny. Now listen, South Africa is going to keep rotting away to the very bottom before an attempt at change will surface. Mark my words. Let's keep it as Botswana. Before they move they will need to recon the area. Small teams will probe and scout out the terrain and enemy. So now when Botswana opens fire they know that in that general area is a SA milltary camp. There are no bases in the area. So in a suprise attack the target would be camps. These are not big and not built to be defended against a attack. Another method is the use of a observer. The most destructive system in use by the military is the radio. Useing BH against Nigeria. A lone man could set up in a concealed postion and direct the mortar fire. If your mortar can see the enemy then you doing something wrong. moffie,that isnt the scenario with boko haram.BH is a terrorist group not a coventional army,you keep mixing it up because SA doesnt have COIN/CT training and experience. One thing that separate SA and Nigeria is development. Despite corruption in SA but development is heading forward, with our struggling economy or not. We are the only country in Africa that build free houses and free services. I have been to many countries in Africa including Nigeria, but all that I see there is disappointing. Nigeria in particular is a bush outside Lagos and Abuja. Even Lagos is still under developed in many respects. In Limpopo 5 000 children had no textbooks for more than six months because the government stuffed-up a delivery contract. Across the country the government has lowered the high school pass mark to 30% to ensure matriculation rates don't collapse under the weight of low-quality teachers, protected by government-allied unions. At an upscale housing estate in Pretoria ill-trained or reckless police tramp through a suspected murder crime scene, putting their own case in jeopardy, while some investigations into the politically connected are dropped. "The whole policing sector is a failed institution. It has become like a militia - like Haiti's Tonton Macoute," said political analyst Moeletsi Mbeki, the brother of former president Thabo, referring to the brutal paramilitary force created by ex-dictator Francois 'Papa Doc' Duvalier. You don't know anything about the story of textbook saga. The book were delivered but instead they were dumbed in the dumping site. Nigerian school children know nothing about textbooks. Most of their schools are in bad conditions particularly in Enugu. So, you shut up because I know the poor conditions of schools in Nigeria. And a facility that was once one of Africa's finest hospitals is now plagued by broken equipment, a lack of basic medicine and despite having 3 200 of them, a lack of beds. At the advent of democracy on 27 April 1994 Baragwanath Hospital had a stellar reputation, receiving referral patients from far beyond South Africa's borders. Its doctors had already successfully separated conjoined twins, while Groote Schuur hospital in Cape Town was the first place in the world to successfully carry out a heart transplant. With universal suffrage came a duty to care for tens of millions of black patients who had largely been denied access to quality care for most of the previous century under racist apartheid laws. "Things have got worse, it's so bad, it's actually frightening," said a black senior doctor at the hospital who asked not to be named. He remembers an incident two weeks ago when three very ill patients were forced to share a bed in an admission ward that checks in more than 100 patients each day. "The one in the middle died and suddenly these two people were sandwiching a corpse," he recalled indignantly. In another recent case a woman was forced to share a bed with a male patient. State "hospitals were much better run under apartheid", he said, dismissing suggestions that the expansion of medical coverage to black patients is the root of the system's problems. If you touch the issue of hospital, do yourself a favour and shut up, because we both know how bad are Nigerian public hospitals which do not even offer free medical care. SA provide free medical care and is about to implement NHI, the first country in the world to do so. The country which will pay for its citizens medical care even in private medical facility. This initiative assures that every citizen of SA will have a medical aid of their own, dummy. you must be a zombie schizophrenic baboon. Your hospital shares 1 bed to 3 patients. A dead patient got sandwiched in between two loving patients, plus your operations are carried out by touch light, not even a generator set. Your government reduced pass grade to 30%. This anomaly don't happen in Nigeria, not even in during the civil war. Nigeria has the NHIS ( National health insurance scheme. In delta state, all pregnant women goes through free ante natal and deliveries. You can have intelligent officers with degrees from every military academy in the world get beaten by rebels.